Maintaining / fixing a shop heater. Mr. Heater Portable Buddy pilot won't light. It's been a warm winter here in Texas, so this really has been not needed, but I was in the mode of fixing, cleaning and testing equipment, including all my propane and white gas fired appliances, and I found the pilot on the Portable Buddy heater wouldn't work. 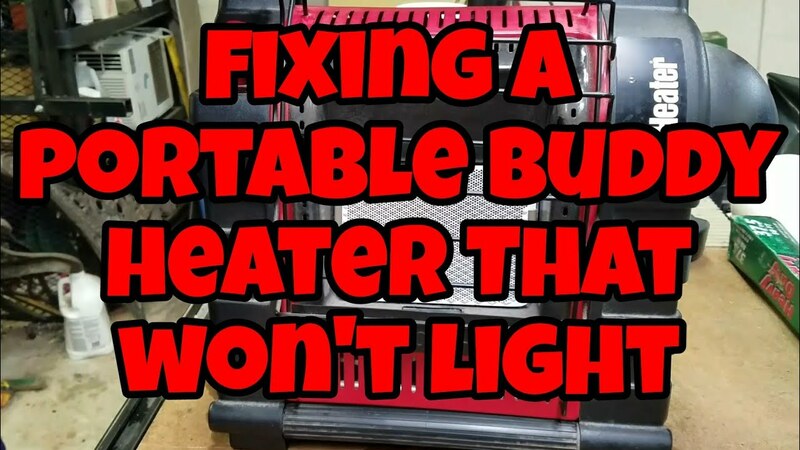 I did some research on the Mr. Heater site, and found the recommendations from Mr. Heater on how to fix it... For what it's worth, I did the video for a specific youtuber that has had problems with several of these over the years and he keeps replacing them. I figured this would help him. Our shop / tent / deer blind propane heater wouldn't light. Here is how we fixed it. My mom bought a gas fireplace heater back in the early '80s from the local gas company. Around 2000, it got to where the pilot would not stay lit most of the time and if it did, the fire would burn for 10 to 15 minutes and then go out. She paid $500 - $600 back then. I checked with the local / city gas company and they said they did't repair them anymore nor do they have spare parts or offer any suggestion. I checked with several companies in Memphis. All said the same thing. I also asked what to look for if I tried to fix it myself. No one would offer anything. Well, I said it can't be any more complicated than overhauling a diesel engine in a truck or a manual transmission in a pickup or as complicated as writing HTML for a web site in Japanese. I took it apart, every single bit. Very carefully. gaskets were soaked in WD-40 to keep them flexible. Cleaned every bit by blowing it out with air, especially the gas lines from the cut off valve to the controller valves and pilot line feeder. Wiped everything I could and put it back together gently but tight. Been working since. It has been 16 years and still works great. Lee.... you are right, not complicated at all. Just a thermocouple that must stay hot to maintain gas flow to the burner. Now with the new programable thermostat heaters you have a circuit board that's anyone's guess what's wrong. Fixable only by those with electronic device knowledge and trash to the other 98% of the population. Yeah, "fixable" by replacing the whole board or module. We have an early 80s furnace that quit working on Super Bowl Sunday this year. It had an old electromechanical gizmo that, when the call for heat came, would turn on the gas to the pilot, spark-ignite it, prove the flame, then fire the main burner. It evidently wore out because when the main burner kicked in, voltage would immediately drop out and cause the main burner to go out, relight, go back out, etc. for 8 or 9 times then the whole control would lock out. Replaced it with a new modern electronic module ($180 at the local parts store... $90 online, but I needed it immediately so the house didn't freeze up). Incidentally I have that exact same Mr. Heater. I bought it years ago hoping to take the edge off the cold in my garage/shop. It was ridiculously undersized for the job so I bought a much bigger heater and rarely use this one. It sat under my CMS for many years and got super dusty, but recently I blew it off with compressed air and it fired right up. My backup heater for the shop is a Mr.Heater 15000 btu tank top beast. It uses the 20 lb tanks and is pretty stable. On low it will run for a long time. I have operated it for a week on 1 tank. It has the simple thermocouple and is not auto start. I'm good with that and use a bar b q long lighter. For storage I put it back in its original box, keeps it safe and clean, tank goes back outside. I have an Empire brand vented wall heater in my home in Painted Post. It worked spectacularly for close to 15 years and then I started having problems with it. Had the service (local gas appliance company) replace the primary valve and it worked through that winter and that was about all. The following fall it failed again. Long story, short... it was getting water into the valve from a corroded vent. So much for that. But a portable, that shouldn't be the problem unless you have condensate build up OR spiders... spiders love getting into the tubing, if there's a way. Also, depending on your gas supplier and how clean te supply might be, you can get some carbon or soot build up. Problem with many of these pilots and their thermocouples is that they need to be kept clean. For my shed here in Binghamton I finally went the route like CapnCarl.... and bought a twin parabollic from HF, mounts on top of a portable 20 # tank and works great, putting out about 30,000 btus with both sides running. The shed is not air tight and there are vents at both ends of the gable but still I consider this a temporary setup. It does the job though, heating the 12 x 20 gambel-roofed, no insulation yet, area up in about one hour. That's up to 58 degrees in 20 degree weather with lots of snow in the yard and on the roof. Still, it's eating up the oxygen pretty well and you've got to have some good ventilation to be safe.